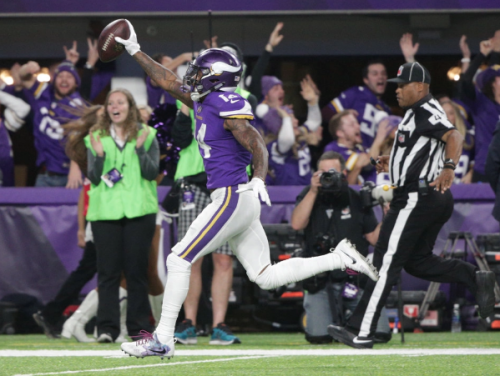 Minnesotans are usually a phlegmatic bunch, generally avoiding drama, but this year Minnesota has football fever—not only because the state is hosting the Super Bowl, but more importantly because the local team, the Minnesota Vikings, could be the first team to play the Super Bowl in their home stadium. There is a buzz in the bar unusual for Minnesota; the no-nonsense capital of America and Lake Street is ground zero for Vikings fever. If traveling to the Super Bowl is outside of your budget range, but you still want to experience the excitement of the big game in a hometown atmosphere, head to Lake Street. On game days it is not hard to imagine that you aren’t in Greenpoint but in Minneapolis, as a host of rabid, purple-clad fans transform the normally calm bar into a raucous, cheering den of Viking maniacs. Lake Street, however, is more than a sports bar. The place has a down-to-earth ambiance that attracts a lot of locals. Here, you can relax with a well-made, quiet drink. Minnesotans are known as being quiet people who neither like nor create drama, and Lake Street exudes the laid back feel of a Midwestern small town watering hole. 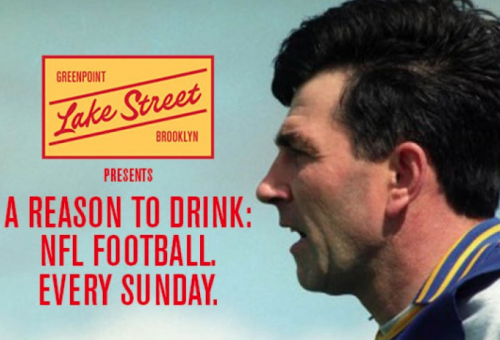 The bar got its name because so many Great Lakes cities have a main street called Lake Street, and the place is normally an oasis of calm in increasingly hectic Greenpoint. Ironically, the bar was conceived of by an Irishman, Steve Howlett from Derry, Northern Ireland who opened it together with a group of locals from Minnesota. 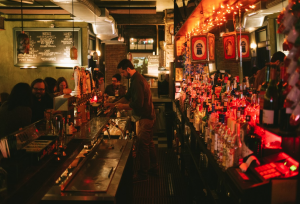 Running another bar on Franklin Street a few years back, Howlett noticed a plethora of Midwestern driver’s licenses when he was checking ID’s and he hit on the concept of opening a Midwestern bar and grill. He pitched the idea to some of his friends, Greenpoint-based Minnesotans Eric Odness, Frank Bevan, Bobby Drake and Rob Pope, and soon the bar was born. One of the attractions of the bar is the subdued lighting and chill atmosphere that makes Lake Street an ideal place for a date or an intimate friendly conversation. Lake Street has perhaps the cheapest happy hour in the neighborhood from Monday to Friday from 4pm to 8pm when tap beers are four bucks and mixed drinks are five. The afternoon crowd is, as you may have guessed, a laid back group of people who come in for a quiet libation after work and some camaraderie. Although the atmosphere is usually very serene, there might just be a bit of excitement in the next few days as Viking fans bubble over with excitement at the thought of winning the super bowl at home in Minnesota. Today’s game—the Vikings are playing the Philadelphia Eagles—starts at 6:40pm and you can be sure Lake Street will be showing it. Truth in reporting Geoff., as you know the Vikings got creamed by Philly the next week which was yesterday Sunday Jan. 21 after being favored to win. The previous game was fantastic like you said.